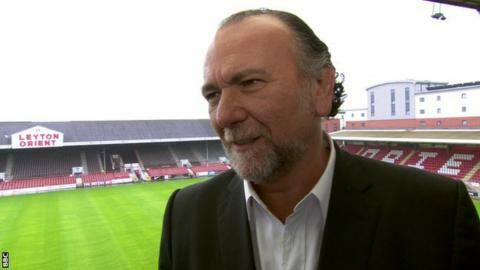 Leyton Orient president Francesco Becchetti has been given a six-match stadium ban and fined £40,000 by the Football Association for aiming a kick at assistant boss Andy Hessenthaler. He was charged after television pictures captured the incident after the win over Portsmouth on 26 December. An independent regulatory commission decided on Friday the 49-year-old was guilty of a charge of violent conduct. Becchetti, who requested a personal hearing, can appeal against the ruling. The Italian, who bought the O's in summer 2014, had accepted his actions were improper but strongly denied it was violent conduct. "Mr Becchetti is deeply disappointed with the decision that has been taken by the Football Association Regulatory Commission, which he does not believe reflects the events on Boxing Day," said a club statement. "Mr Becchetti will consider an appeal upon reviewing the written reasons of the panel."